We have had some new Nigerian Dwarf Dairy goat kids born 11 days ago. This is from our new doe, Meg’s Mini Rachelle, and our new buck, Amasanti BB California Gold (aka Fred). I in particular was looking forward to this breeding with great anticipation because Rachelle is a Swiss marked Nigerian and I have never had one of those before. Fred is a Gold and I haven’t had that one before either. I have had a cream, possibly a gold but never in a buck. Fred is from a buck recently imported from California and Rachelle is also from lines totally new to my herd. I researched the lines and have brought in some pretty goats but only after making sure they are from very milk producing lines. I bought several new bucks this year and a few does as well. The bucks specifically are from proven milk lines and should be of the quality that my does are. In the past, I believe my bucks were more neutral when it came to milk production and now I have bucks that are as high or higher in milk production than my already high producing does. I am hoping that it will breed my does, who are already high producers, up even farther. My goal is to have my does and their daughters all be half gallon or 4 lb a day milkers or better….always. I don’t want average milk production or low production that so many Nigerian breeders seem to think is standard. I am not focused on only pretty faces or eye colors. I have pretty faces and fabulous eyes but not at any expense in the milk pail. Dashing colors and sparkling eyes do NOT put milk in the pail. 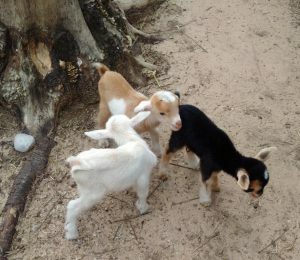 Nigerian Dwarf Dairy Goats are just that….DAIRY GOATS! I have been a closed herd since moving back from Colorado to Michigan. We did our testing and with the herd negative on their tests, it is now time to close the herd back up. I have a few photos of these lovely little darlings. We were lucky and right there when mama went into labor because she went EARLY! and she had triplets and if we had gone into the house even for that hour or so before coming back out to do evening chores, I have no doubts that we would have lost two of the kids. She popped number 2 and 3 our in about 30 seconds total at once after having had kid 1 about 15 minutes prior. She was a bit dazed, I would have been also with two kids popping out in 30 seconds, so she couldn’t react quick enough to get the sacks off their heads. That left me with towels in hand to help her. I was her labor and delivery nurse. Kid 2 was the only doe in the lot. 1 and 3 are gorgeous bucks. Kid 1 is a black and tan Swiss marked boy. He was the smallest of them all. I think he might have only been a pound and so tiny. But he was strong and up and nursing about 3 minutes after she had his sack off before he was even dry. And 11 days after, he is one of the bounciest of the three! Kid 2 is the doe. She appeared white. But a couple of days ago, I realized she is not all white. She is a Cou Blanc!! I am so excited. I have one Cou Blanc in my herd currently, but Sweet Pea is 13 years old and has never thrown a Cou Blanc herself. This little darling is white head, white neck and white shoulder area and color on the rump. I can see the distinct line mid back where a buck skin pattern would break except her color placements are the opposite of a buckskin. Where a traditional Cou Blanc has white on front and black on rump, this little gal has white on front and pale gold on rump. So I am guessing that Gold is her color family and Cou Blanc is her pattern. She has the little gold strips in the same spots on her nose and face as Sweet Pea has her black strips. 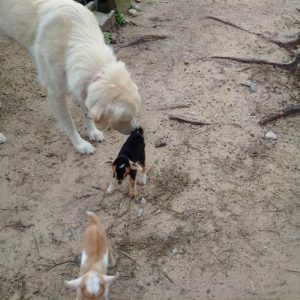 The only thing that Sweet Pea has that this little one does not have is any gold strips visible yet on her legs. Her legs currently just appear all white. Oh and she doesn’t have Sweet Pea’s wattles. So after three hours of unplanned goat midwifery, we returned to our normal lives….minus the hours lost playing with the new kids over the last 11 days. but…..Aren’t they all just so cute?